One of the keys to managing your time and your projects is breaking large projects down into do-able tasks. Writing a book is a massive job, and if your to-do list says “write book,” that item will be there for months, mocking your inability to cross it off. But “write 323 words” is do-able. Write 323 words a day for 31 days, that’s over 10,000 words. Do that every month for a year, and you have a book. 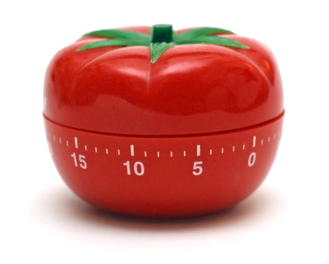 The Pomodoro technique, developed by Francesco Cirillo, recommends breaking your to-do list into segments that can be done in 20-25 minutes. Set a kitchen timer, work on a task until the timer rings, then take a break. (Pomodoro is the Italian word for tomato. The technique is named after Cirillo’s quirky kitchen timer.) If your task is done, move on to something else after the break. If it’s not, you can return to it. Note that 323 words is a reasonable amount to write in 25 minutes. On a good day, you might get even more. There are two advantages to Pomodor-ing. First and foremost, it encourages breaks, which both our eyes and our backs need. Second, it helps us focus on small wins. This was actually Cirillo’s primary goal. if you’re thinking “I have to work on this till it’s done,” the end seems impossibly far away, especially if you’re writing an epic fantasy novel. But if you can say “I’ll work on this for 25 minutes,” and at the end of the 25 minutes check a “pomodoro” off your to-do list, then you feel like you’re getting somewhere. You could write your whole book in 25-minute increments. But sometimes when we’re writing, we get in a state of flow. If that happens, a timer going off could actually disrupt your creative mood. That’s a problem. So use a stopwatch instead. Most smartphones and other mobile devices have an app for that. (I use Alarmed, but there are plenty of others.) Start a stopwatch, and don’t take a break until you’ve passed the 25-minute mark. If you’re like me, the first 10 or 15 minutes are the hardest. That’s when it’s tempting to get up for another cup of tea or a snack. Don’t. Keep writing, push through, and pretty soon you’ll check the stopwatch and 55 minutes will have elapsed. That’s flow. So when you’re making your to-do list, consider which tasks would be better for counting down (usually the boring ones that you have to make yourself finish) and which ones are better for counting up (anything creative where you’re likely to get in a state of flow). Knowing which kind of timer to use when will help you achieve your writing goals. This entry was posted in Writing and tagged Flow, Goals, Small Wins, Time Management.